With our Pinot noir we do one punch down per day while it is cold soaking and then increase it to three times a day while it is fermenting vigorously, and then we back off as the fermentation slowly finishes. 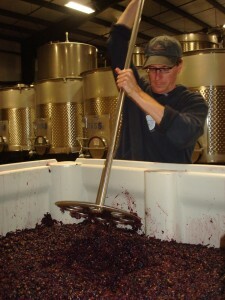 A punchdown involves a tool that looks like an oversize potato masher and gently pushing down the cap (the grape skins, stems, and seeds that form on top of the juice due to CO2 rising from them) into the juice blelow. This allows the juice from underneath to rehydrate the cap. As you push the cap into the juice you see gorgeous purple foam rise up from the fermenting juice. this video doesn’t quite do it justice but you can see the activity in this fermenting Pinot.